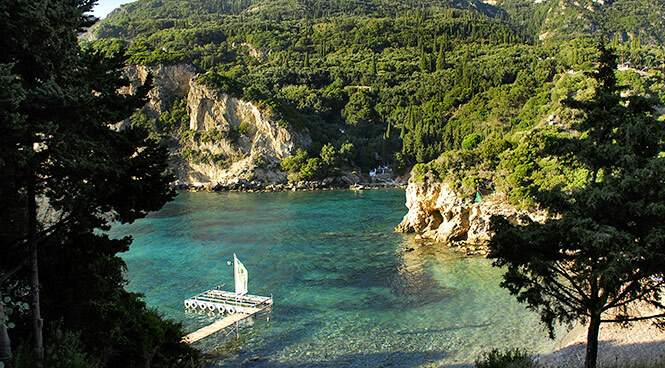 Paleokastritsa is commonly thought to be one of the most beautiful parts of Corfu. The main road leading into the resort is dotted with a choice of good tavernas, many with superb views over the rolling hills to the seafront. The resort also has a choice of excellent sandy beaches. Some of the smaller hidden beaches can only be accessed by boat, which you can hire to explore this area of coastline, or catch the water taxi. The area is popular with families, with a number of attractions. Aside from the beaches and stunning scenery, you can visit the blue water caves, hire a pedalo or even visit the local reptile house!Paleokastritsa is commonly thought to be one of the most beautiful parts of Corfu. The main road leading into the resort is dotted with a choice of good tavernas, many with superb views over the rolling hills to the seafront. The resort also has a choice of excellent sandy beaches. Some of the smaller hidden beaches can only be accessed by boat, which you can hire to explore this area of coastline, or catch the water taxi. The area is popular with families, with a number of attractions. Aside from the beaches and stunning scenery, you can visit the blue water caves, hire a pedalo or even visit the local reptile house! Paleokastritsa is one of the most popular areas of Corfu, with people coming from all over the island to see its glorious beaches and stunning scenery. The main road into the resort has a number of tavernas, most with fantastic views over the rich green hills and down to the bays. A choice of good beaches can be found nearby. And if you’re feeling adventurous, you can visit some of the smaller hidden coves and beaches which can only be accessed by water taxi or by hiring your own boat. The area also has a monastery, a small museum and a reptile house. Or, within easy reach by car, is the Byzantine Fortress of Angelokastro, and Corfu’s highest point, Mount Pantokrator. The fishing village of Makrades, which has an excellent market, is also only a short drive away. Closer to home, walking and hiking are popular pastimes around the area, and a great way to make the most of this fantastic countryside setting.